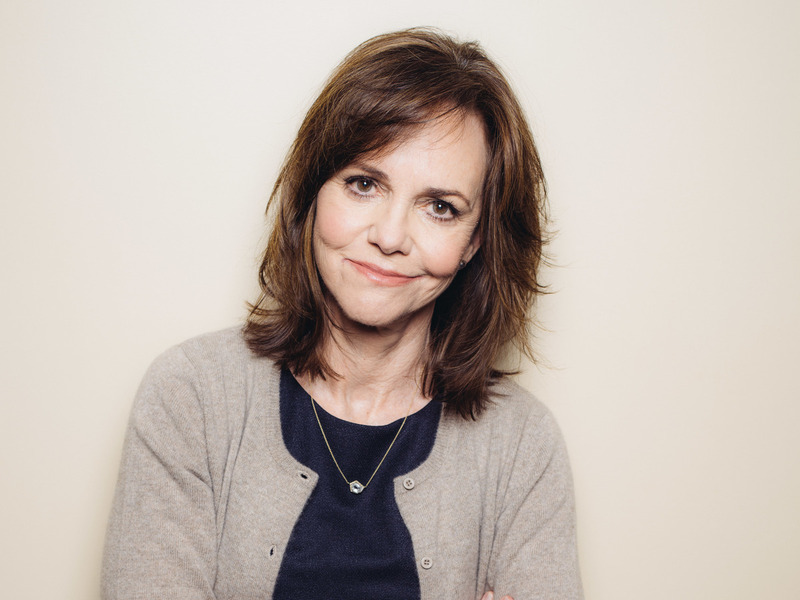 Sally Field Wasn't Sure She'd Have The Guts To Publish Her New Memoir "I wrote it for myself," Field says of her intensely personal accounting of her life and career. In Pieces describes childhood abuse, an abortion at 17 and her relationship with Burt Reynolds. After experiencing abuse as a child, Sally Field says she internalized that "to feel loved you have to be invisible and terrified." Her new memoir is called In Pieces. Field, now 71, got her start when she was a teenager on the 1960s TV sitcom Gidget, in which she played the title character — a squeaky clean surfer girl living with her loving, widowed father. But her TV persona was at odds with her home life. In the book, Field describes the abuse she suffered at the hands of her stepfather, actor Jock Mahoney. The abuse was both emotional and sexual, and Field says those experiences forced her to divide herself into pieces to survive; to wall off the pain and push forward. That impulse showed in her acting. "Like flipping a switch, I began to bubble," she writes about her early roles on Gidget and The Flying Nun. Her wholesome early roles on sitcoms made it nearly impossible to transition to serious projects, Field tells NPR. She remembers signing autographs while waiting in line for unemployment benefits after The Flying Nun was canceled. But she would eventually score serious, challenging roles like Sybil, a woman struggling with mental illness, in the TV miniseries of the same name. She would win Oscars for her turns in the films Norma Rae and Places in the Heart. Throughout the book, Field writes unflinchingly about failed relationships, dubious decisions and missed opportunities. And she gave herself permission to write with such honesty because she wasn't sure she would ever end up publishing the book. "I wrote it for myself. I didn't know whether I'd ever have the guts to publish it," she says. "[But] I felt this urgency, this anxiety, this need to find something that was festering in me. ... I found out that I had to put all the pieces out in front of me and try to fit them together and see if I could witness something ... and know the answer to why I was feeling this way." I would deny myself certain things. I was afraid that I would find out things that I didn't want to know. Even in my own journals that I had written all my life — I guess from my mid-20s on ... I had never gone back to reread them — any of them. Not a page. And I was forced to go back and look at episodes that I knew I had written about and was horrified that I had purposely disremembered them. On going to Tijuana to have an abortion at a time when it was not legal in the U.S. It's deeply ingrained and engraved in my psyche. ... I know how horrible it was for that little 17-year-old girl: How terrified I was and how I might have died. And I think of all the women all over the world who ... lose their lives, or their ability to have other children, or who are so deeply shamed because they live in a society or with a government that chooses to look at unwanted pregnancies in a certain light — that, first of all, [it] is the woman's fault and that the woman has no choice as to how this impacts her life. That the cluster of cells — if you catch it early — is more important than she is. That is horrifying to me. I know firsthand what that's like. Field sits on a surfboard in a promotional portrait for the 1965 television series Gidget. "I represented the 'girl next door,' the 'all-American girl,' " she says. I think I represented the "girl next door," the "all-American girl" much more than was visible. ... Many women of my generation — and even generations before and probably generations now — are going through so many things that are similar to that and yet seen as just the virginal, sunny, happy-go-lucky, uncomplicated girl next door. In the sitcom days of the '60s, there was a clear delineation between film and television, and film did not want anything to do with those who came from television — especially women and especially situation comedy and especially The Flying Nun. ... So it was a matter of trying to break down those barriers. I would just say to myself: If I'm not where I want to be it's because I'm not good enough. Because I felt even then ... that if I said it was because I was facing a system that was unfair, or I was facing typecasting, or you know, if I put it on the "big bad Them," I had no power. I had no power to change anything. I was lucky enough to be taken to The Actors Studio [the legendary acting school run by Lee Strasberg] in Southern California ... and it really changed my life because I could be doing The Flying Nun in the day and yet learning to do the craft at night. "He was a very important part of my life, but for a tiny little part of my life," Fields says of Burt Reynolds. They are pictured together in March 1978. I've always thought of him rather nostalgically. ... He was a very important part of my life, but for a tiny little part of my life. I was only with him for about three years and then maybe two years on and off after that. But it was so hugely important in my own existence, my own movement as a person. I kind of was worried about him reading this — and now at least he's safe from that, because I think it would hurt him. It's not that I say really bad things about him, but I reveal ... what I was feeling and how trapped I was in an old pattern of behavior — and how I was predisposed. He was a preformed rut in my road. And I couldn't see it coming and I didn't know how to get out. I had been carefully trained to fall into this. ... We were a perfect match of flaws. As a child, because of my relationship with my stepfather ... in my mind, to be seen, to be loved, I also had to be terrified and I couldn't ever say what I was really feeling. So I had to be invisible. Do I still have that gnawing, you know, hair-on-fire feeling of needing more and wanting to reach out for something that's just outside of my grasp? Yes, totally. Yes. But can I now look back and feel the length that I've traveled? Yes. And I couldn't do that before. And I think a lot of it had to do with the system that I had set up as a child to keep myself from seeing the truth. Connor Donevan and Jolie Myers produced and edited this interview for broadcast. Jessica Reedy and Beth Novey adapted it for the Web.